Just a simple dinner with a pasta and a salad. I grabbed a bottle of red from the wine fridge and woh, where did I buy this wine? 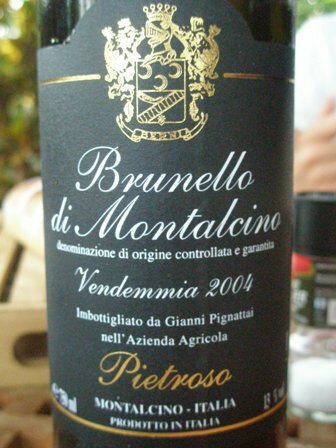 It was a ripper of a red, ‘2004 Brunello di Montalcino’ by Pietroso (about 100 km south of Florence in Tuscany). Aged for 36 months in oak barrels, this 100% Sangiovese wine is just a wonderful drop. Intense forest fruit flavours, great structure, good mid-palate weight and a long finish, round and silky. It took us by surprise. 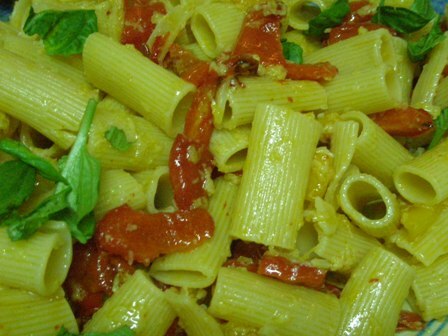 We had just a simple pasta for an ordinary dinner during the week. When I went back to the supermarket the next day to look for this wine, I could not find it any more. I know why: it’s marvelous. Look out for this Brunello di Montalcino. It’s worth it. Azienda Agricola Pietroso produced 2004 about 13,000 bottles of this Brunello. I think it was one of the best wines we had had recently. This entry was posted on Friday, November 27th, 2009 at 9:46 pm and is filed under food, wine. You can follow any responses to this entry through the RSS 2.0 feed. You can leave a response, or trackback from your own site.